Greg and I arrived to our hotel at 9 am after our 13 hour flight from Brisbane to LA, our very first trip overseas. We had been married for exactly 48 hours and were as exhausted as we were happy and pumped to have arrived. Unfortunately we hadn’t researched Anaheim at all before we got there and had slightly misconstrued ideas about its size. For some reason, we had it in our heads that since our hotel was in Anaheim and Disneyland is also in Anaheim, then we ought to be able to just walk there. Wrong. Wrong, wrong, wrong, wrong, wrong. Although we weren’t going to dare attempt one of our days at Disneyland while fresh off a plane jet lagged as hell, we thought we would walk to Disneyland Resort and visit Downtown Disney, grab a bite to eat and explore. I swear it didn’t look that far away on Google Maps. Anyway, this jet lag thing wasn’t so bad. We were actually feeling pretty good. We’d just had a massive second breakfast (the one on the plane didn’t count) at the hotel, complete with dinner plate size pancakes and Frosty Flakes. It was a rainy morning, so the air was cool and fresh and the California sun was tucked well away. Lovely day for a walk. It turns out that although Disneyland was only a 10 minute drive on the freeway away, it was a one hour and 20 minute walk. About 45 minutes after we set off, the hot California sun was beating down on us. We had walked past a Walmart, a Dollar Tree and three fast food outlets but Disneyland yet eluded us. We decided to walk back to the hotel and call a cab to shuttle us the rest of the way. Otherwise, we’d find a way to get to somewhere like Santa Monica or Long Beach or for an explore. And that’s when the jet lag set in. As I turned to look back at the distance that our now dragging feet had put between us and the hotel, the Sandman very rudely and abruptly threw a huge chunk of sand right in my face. A wave of exhaustion burned at the back of my eyelids. Every one of my muscles became floppy and tingly, begging me to just curl up on the sidewalk and fall asleep. I sat down at a bus stop bench, feeling faint. Greg came and sat beside me. I think he felt the same way. At that moment, a bus came rolling up the road and I seized my opportunity. The bus could get us back to the hotel, surely! I hailed it down, Greg expressed his apprehension, I marched confidently on board and we sat down. I rested my head on Greg’s shoulder, he put his head on mine. And we promptly fell asleep. I am vaguely aware of waking up a few times on the way. Outside Knott’s Berry Farm. A Carl’s Jr. Past the naval base, studded with those iconic California palms. And then the bus stopped and this time it didn’t keep moving. And Greg and I were being shaken awake by a firm but gentle hand on Greg’s shoulder. We sat up sharply, blinking the sleep out of our eyes and hastily wiping the drool from our mouths. “Hunh?” we gazed up stupidly. “Our hotel,” Greg said, distantly concerned. “Back in Anaheim,” I added thickly, vaguely aware that we had gone a long way past it. Sheepish and still wiping the sleep from our faces, we shuffled off the bus, and looked around. And I felt like we had fallen asleep and woken up in paradise. We had, in fact, woken up in Seal Beach in the westernmost corner of Orange County, California. There is something eerily familiar about wandering through Old Town in Seal Beach. It’s like you’ve been here before, or have visited in dreams. It looks like something out of a storybook you read in your childhood but now only vaguely remember, a seaside Main Street USA town. 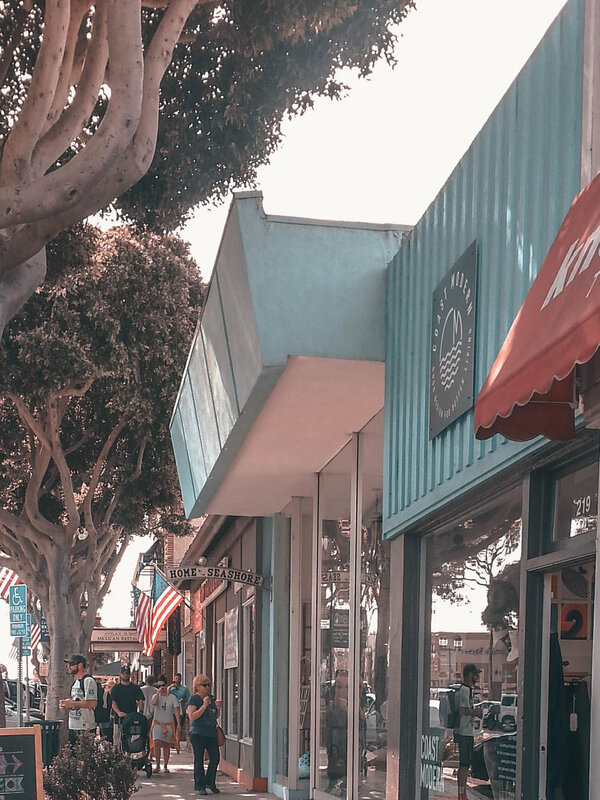 Seal Beach’s energy is the quintessential laid-back, relaxed beach vibe. It combines a quiet seaside town ambiance with an on-trend urban flare. Main Street in itself is worth poking around: with souvenir stores and cute boutiques dotted throughout, the Red Car Museum and if you’re hungry, there are plenty of places to eat with 1940s themed diners, ice cream parlours, seafood eateries and taco stands to choose from. The streets themselves were calming and pleasing to the eye: pristine clean and fastidiously maintained. But it was Seal Beach’s pier that truly stays in my heart. 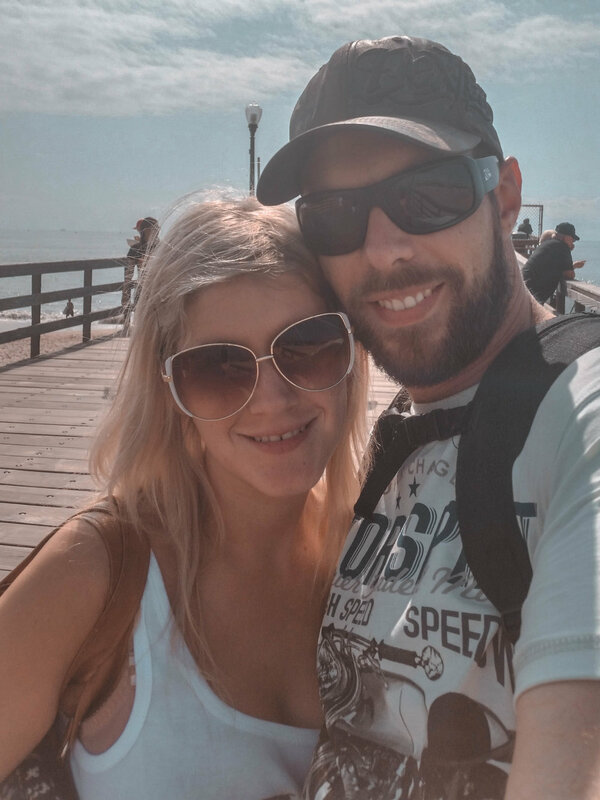 As we emerged from Main Street, Seal Beach’s long wooden pier (the second longest in California), bathed in that divine yellow Californian sunshine, beckoned to be experienced. Couples strolled along the boardwalk, and gazed out across the ocean whilst below us on the beach, children played and frolicked in the shadows and a group of kids played beach volleyball. Truly, this shall be one of my happiest memories: strolling hand in hand with my new husband down Seal Beach Pier, the delicious smells from the restaurants in Main Street being carried across to our nostrils on the cool Californian sea breeze, the cawing of sea gulls, the warm Californian sun on our backs and tired faces as we listened to the waves gently lick the golden sand below. Somewhere in my heart, I think I will always be here, wandering along this jetty with that yellow sunshine on my skin. I fell accidentally in love with Seal Beach. Had we had every second of our trip planned to the tiniest detail, we would have known exactly what to do on our first day in LA, never jumped on a bus and fallen asleep and we would have never discovered what has become one of my favourite places in the world. Sometimes, the most memorable parts of travel are the accidental, unplanned moments: so go with a rough plan in mind and a wanderer’s heart and leave a little wiggle room for unexpected adventures. Oh…. and if you should ever find yourself in Los Angeles someday… make sure you pay this place a visit and send my love.